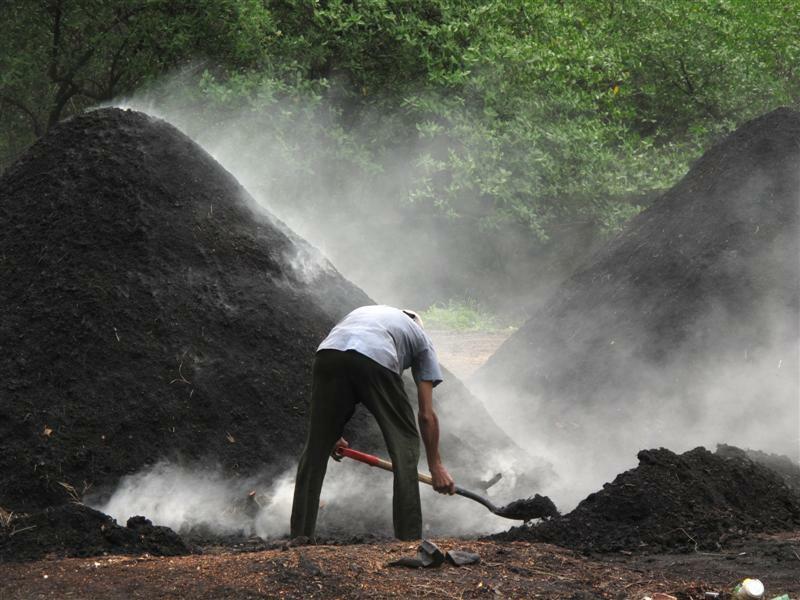 White smoke swirls around a man who is shoveling soil onto a perfect conical mound. 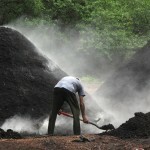 He shovels and then pats down the black peat, working his way round the mound. The wind changes and blots him from view for a few moments, then he reappears, still shoveling and patting. 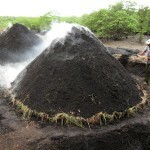 Carbonero attends a smouldering charcoal mound. He is a carbonero, a charcoal maker, and he is sealing up the ventilation holes in an earth kiln, lit just hours ago. 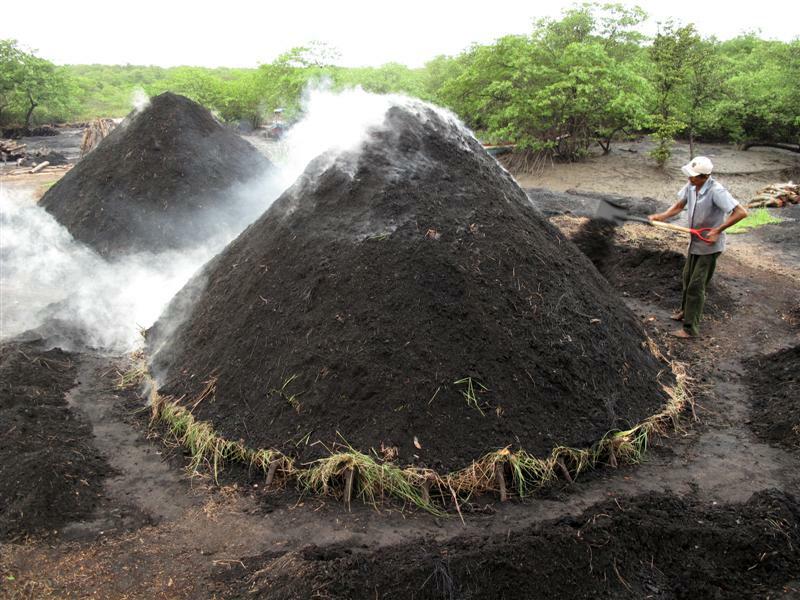 The mound will smoulder for six days, and when it is opened the chunks of mangrove timber inside will have been transformed into charcoal. The work is happening near a town called Chame, 50 km south-west of Panama City. In this region many rivers spill into the Pacific and the coast is thick with mangroves. The majority of people here depend on mangroves. They earn a living by cutting mangrove poles for construction or converting the timber into charcoal, and they sustain themselves by fishing and collecting shellfish from the mangrove forests. Stack of mangrove wood prior to being covered with grass, then earth and converted to charcoal. 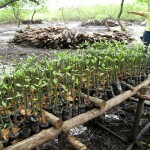 In 2004, Panama’s environmental authority (ANAM) became concerned about pressure on the mangrove resource. Three hundred families in the region were found to depend on mangroves for their livelihood. 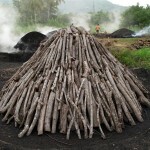 At least 100 charcoal kilns were in operation, each consuming 15 to 20 mangrove trees per month. Pole cutters were taking 100 trees per month. “The forest could not support so many people cutting so much,” ANAM’s José Berdiales told me. With financial backing from the International Tropical Timber Organisation, ANAM began a project to manage and conserve 4000 ha of mangroves in the Chame region. Some areas were placed off limits to cutting, some were slated for replanting, and some were to be used in agroforestry. Once the mound is alight, the ventilation ports at the bottom are sealed off. Now, five years later, the project is in full swing. Near the charcoal mounds, I saw a small nursery of young mangrove seedlings. Reforestation began in 2005, and the resulting stands are already more than two metres tall. Many of the initiatives have been implemented by Juliana Chavarria, a young ANAM staff member who explained some of the challenges to me. “Some of the people weren’t happy to have any restrictions placed upon them,” she said. “They believe the mangroves will never end.” Juliana realized she needed to find ways to create a win-win outcome for the communities and their forests. For communities, the “win” that would have the biggest impact was more money in the pocket. Juliana Chavarria with mangrove nursery. 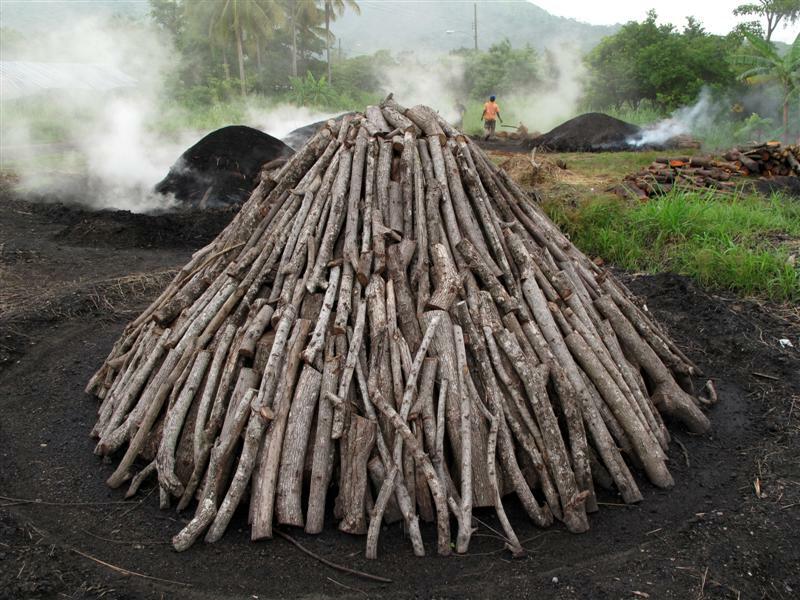 One pilot scheme that has shown great promise has been the production and marketing of “eco-charcoal.” Ordinary charcoal sells for a pittance. Carboneros get $2 for a 35 lb sack from a distributor who on-sells the product to restaurants and other users in Panama City. Juliana negotiated with a supermarket chain and found that the same sack of charcoal would sell for $13 if it were repackaged in 8 lb lots. “Everyone benefits,” Juliana said. The carboneros get more money, the supermarket stocks a quality product and the consumer has the satisfaction of supporting a sustainable harvest. The new product, developed with just one of the Chame communities, is about to be launched, and if successful will be rolled out to four other communities in the area. 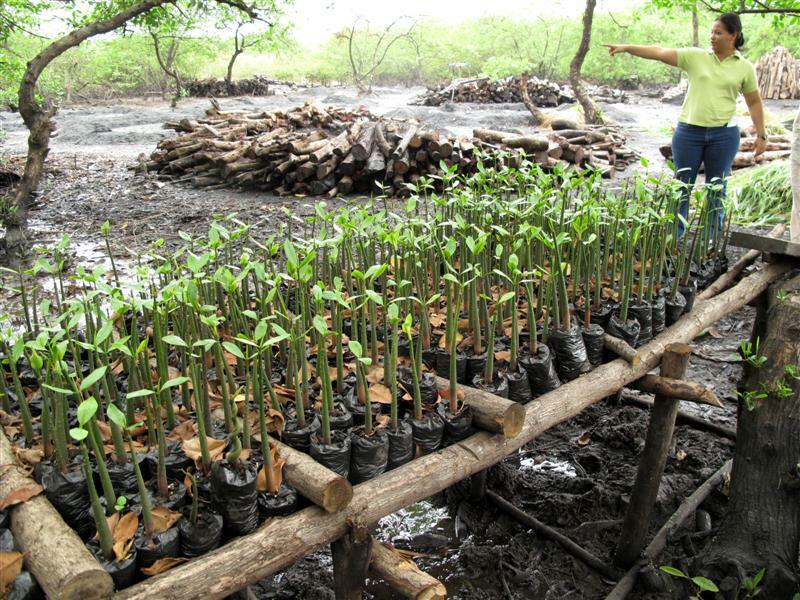 The Chame project is Panama’s first mangrove conservation effort. But mangrove protection is by no means the norm in Panama, as the next few days would show. 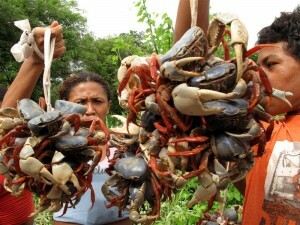 Mangrove crab sellers on the road to Chame. Zoom in on the mangrove forests and coastal communities we're visiting during the Last Stands expedition. Your contribution will help save the rainforests of the sea. Last Stands is powered by WordPress.